Brush steak with 2 teaspoons of the olive oil. Heat a large char grill or non stick frying pan over a high heat. Grill the steak for 2-3 minutes each side, for medium. Transfer to a clean board, cover loosely with foil and set aside to rest for 5 minutes. Thinly slice steak, across the grain. Meanwhile, blanch broccoli and sugar snaps in a large saucepan of boiling water until tender crisp. Refresh under cold running water. Drain. Add vegetables and avocado to quinoa. Whisk together orange juice and remaining olive oil. Add to salad and gently toss to combine. Serve topped with some slices of beef. Blend 2-3 (30g) slices of steak with 1 tbsp quinoa, 2 pieces (15g) broccoli, 1 tbsp orange juice and 25g avocado until smooth. Blend 2-3 slices (30g) beef, 2 pieces (15g) broccoli and 1 tbsp orange juice until partially smooth. Stir through 1 tbsp quinoa and 25g mashed avocado. 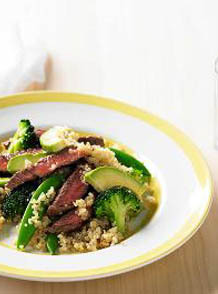 Place some slices of beef, broccoli florets, sugar snaps cut in half and diced avocado on a plate. Serve with a small bowl of quinoa. Place some of prepared salad into a shallow bowl (cutting steak into smaller pieces), serve with a fork. Avocado is ideal to add to purees, due to it’s soft creamy texture and babies love its mild flavour. You can substitute the quinoa with another grain such as couscous, cracked wheat or brown rice. Refer to packet for cooking instructions. If using quinoa, this salad is gluten free.